The deficit this year is expected to be $514 billion -- just 3 percent the size of the economy and significantly less than the $1.4 trillion deficit Congress ran up when it pumped stimulus into the economy in 2009. "Although the deficit in the Congressional Budget Office's baseline projections continues to decline as a percentage of GDP in 2015, to 2.6 percent, it then starts to increase again in 2016, reaching 4.0 percent of GDP in 2024," said the CBO. "That figure for the end of the 10-year projection period is roughly 1 percentage point above the average deficit over the past 40 years relative to the size of the economy." Why do we have such a large federal budget deficit today, in spite of the current reductions of CBO projections? It now totals $17 trillion counting the US Treasury's own debt to itself -- when we had 4 consecutive annual surpluses in the Clinton years of 1997 to 2001, and an overall budget deficit reduced to $3.2 trillion in privately-held debt. The answer in a nutshell is unrestrained human greed, something that even Alan Greenspan recognized, though he wouldn't admit it was the result of his own laissez faire market ideology of lower taxes and less market regulation. ''It is not that humans have become any more greedy than in generations past," he famously lamented in 2002 testimony before the Senate Banking Committee. "It is that the avenues to express greed had grown so enormously." That quote was not only ingenuous -- humans have always become more or less greedy depending on those so-called opportunities for greed -- but it was his decision to back GW Bush's deficit spending that erased the Clinton budget surpluses. "Continuing to run surpluses beyond the point at which we reach zero or near-zero federal debt brings to center stage the critical longer term fiscal policy issue of whether the federal government should accumulate large quantities of private -- more technically, nonfederal - assets," he said at the time. "At zero debt, the continuing unified budget surpluses currently projected imply a major accumulation of private assets by the federal government. ... This development should factor materially into the policies you and the administration choose to pursue." In fact, it was the unregulated greed of Wall Streeters that Greenspan had encouraged in opposing deregulation of derivatives -- used by regulated banks, as well as unregulated hedge funds -- that led to the Great Recession that bankrupted millions. 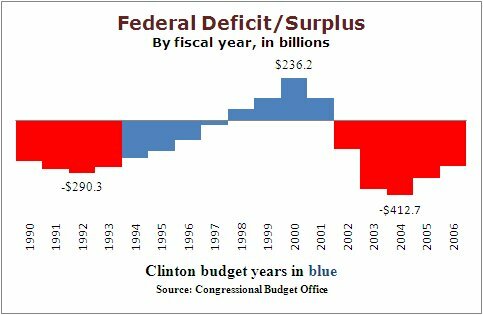 The Clinton surpluses had almost balanced long-term federal debt, and first Bush Treasury Secretary Paul O'Neill lost the debate on what to do with that surplus. He had wanted the surplus to strengthen social security, Medicare, and other government spending programs. O'Neill was fired for his opposition to the Bush tax cuts. In other words, Greenspan gave Bush the cover he needed after 9/11 to use that surplus to finance tax cuts on capital in particular -- including abolishing the inheritance tax, lowering capital gains and dividend taxes almost 50 percent -- that mainly benefited Wall Street and its investors, rather than Main Street. "Why did corporate governance checks and balances that served us reasonably well in the past break down?" he asked. "At root was the rapid enlargement of stock market capitalizations in the latter part of the 1990s that arguably engendered an outsized increase in opportunities for avarice. An infectious greed seemed to grip much of our business community." We have you to thank, Dr. Greenspan, for those "opportunities for avarice" that resulted from of your unbridled enthusiasm for such policies at that time. It also brought on the Great Recession and record deficit we have today.